Installation of the theme is very basic things for WordPress user and any one can do. 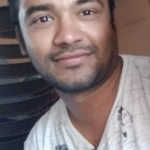 But this post I have specially written for guys who are very new to the WordPress content management system. There are tons of premium and free themes available for WordPress and you surely want to try few of them until you get best one as per your need. There is 2 way of installation WordPress theme. We will discuss here both way step by step. 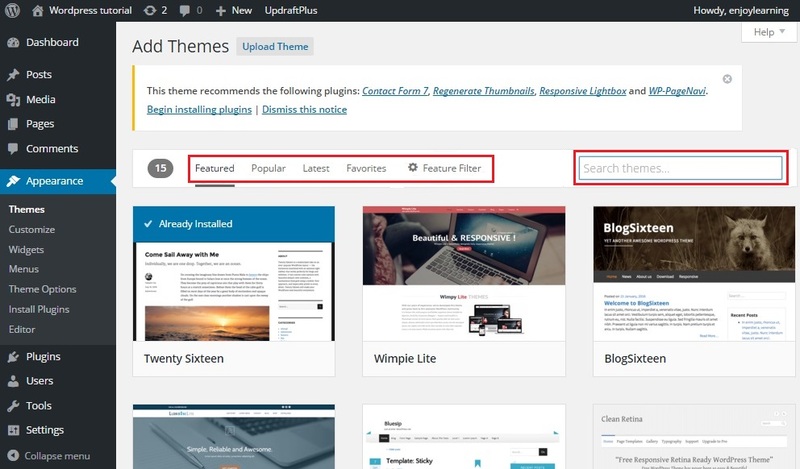 Here You just need to search your required type of theme and you will get free themes from wordpress.org. Firstly Select appearance from the left side menu and click on theme link under appearance as below. 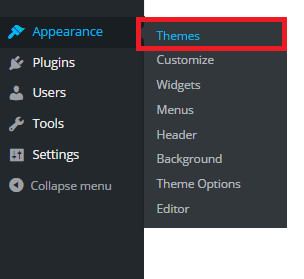 In themes page, you can see few default themes of WordPress, so you can choose from default theme by just clicking on the Active button associated with all theme. 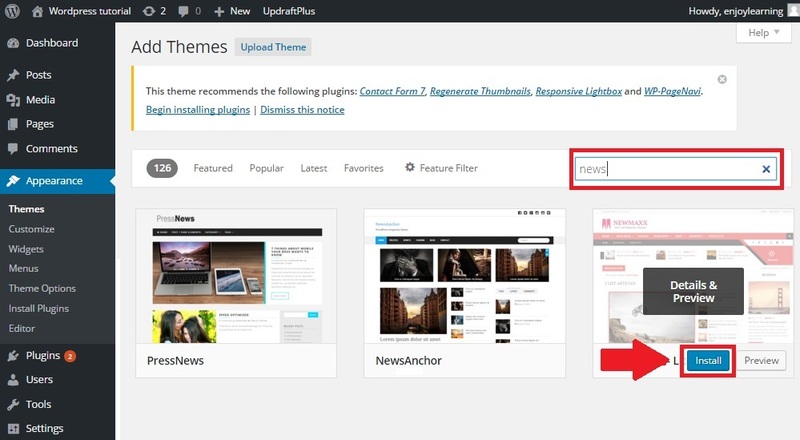 If you don’t want to use default theme then you can choose from WordPress free theme storage by clicking on add new theme as below screen. Or click on Add new link on the top of the screen to add a new theme. Step 3:-Here you can search best wordpress theme as per requirement .You can see theme on basis of feature, popular and latest . You can also apply feature filter to select appropriate theme for your website on basis on colour , layout , feature and subject . Step 4:-Now click on install button to get installation of particular theme as below. Step 5:-Once theme get installed then check how it look like by clicking on link Live Preview . If you like theme for your niche blog then Active theme by clicking on link Activate so user can also feel test of your choice. Once you click on activate link then user will see your website as per activated theme . 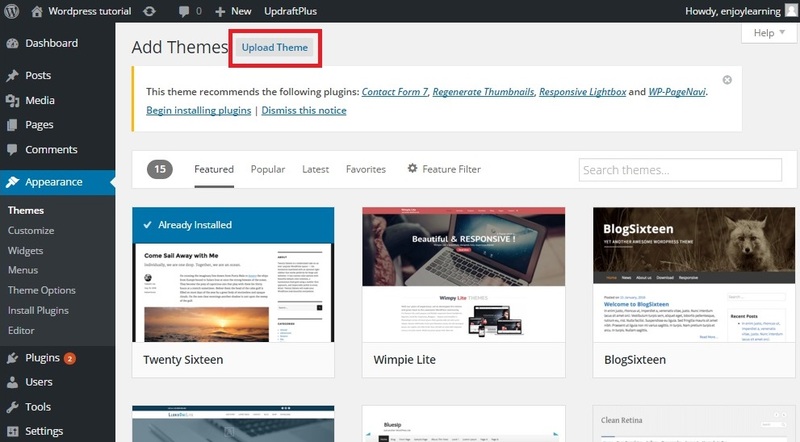 All premium themes and themes which are not belongs to wordpress.org need to be upload .So in order to upload theme you need to follow above steps till 2nd then follow below steps. Step 1:-Click on upload theme link at top of wordpress dashboard screen as below . Step 2:- Now download theme from any website which you find suitable for your niche theme. Note:- Theme must be download in Zip format. Step 3:-Then click on Choose file . Once you choose any theme file then install by clicking on install now button. Once theme get installed then you can activate theme so user can see beauty of your website.